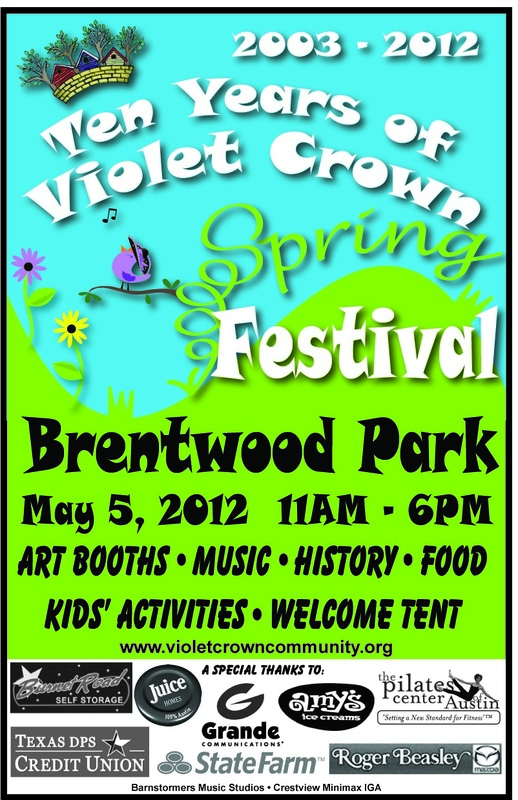 There’s no better way to enjoy a spring Saturday than by spending it at the Violet Crown Festival, which will be held on May 5 from 11 a.m. to 6 p.m. at Brentwood Park (6710 Arroyo Seco, 78757). Admission is free. 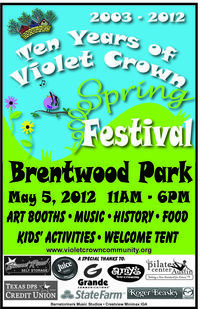 The festival – staged by Violet Crown Community Works (VCCW) — will feature local arts and crafts vendors, family fun, children’s activities, live music, and refreshments. The festival’s major sponsors are Amy’s Ice Creams, Burnet Road Self-Storage, Grande Communications, John Dunham/Juice Homes, The Pilates Center of Austin, Roger Beasley Mazda, State Farm/Nancy Callahan and Texas DPS Credit Union.